Plenty happening this Halloween, but if you're a fan of swing or rhythm & blues, then the place to be is Swing Mon Amour @ Charlotte St. Blues - a lovely, spacious, new venue with wooden floors. 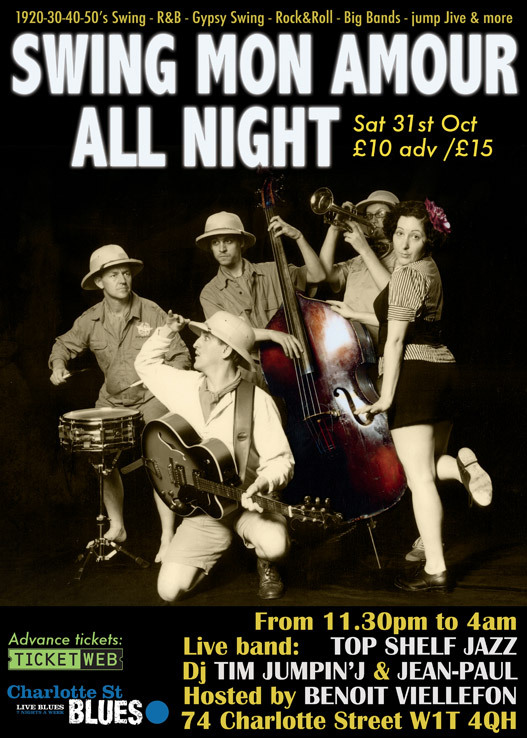 There'll be hot swing from Top Shelf Jazz and I'll be on the decks alongside Tim's Jumpin' Jive (Hellzapoppin') to keep your bones shakin' till 4am to the sounds of r&b, jump blues, rock 'n' roll, swing and hot gypsy jazz from the 1920s-1950s. So whether you're a Lindy Hopper, jiver, or just a lover of good old vintage music, come along and raise hell on the dancefloor! I'll also be DJing at the weekly Swing Mon Amour Tuesday session on 20th October and admission is free. So if you fancy a mid-week dance or just want to check out the venue or get a taste for the sort of music I'll be playing on Halloween, why not pop by?